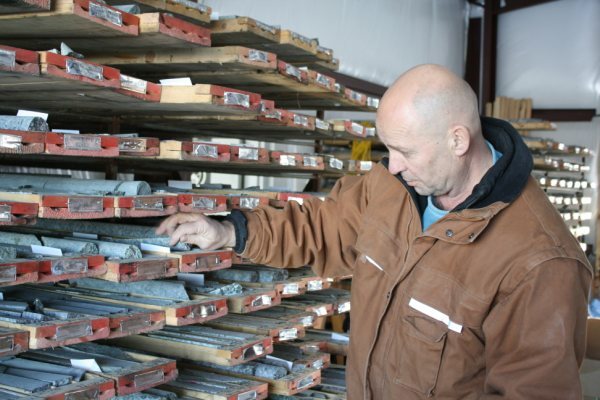 Results: Drilling results include: 53 g/t Au / 0.55m, 32 g/t Au, 33g/t Ag, 1.36% Cu / 0.40m, 5.2g/t Au, 25g/t Ag, 8.0% Zn / 1.5m. Surface grab samples up to 101g/t Au; channel samples up to 132g/t Au. 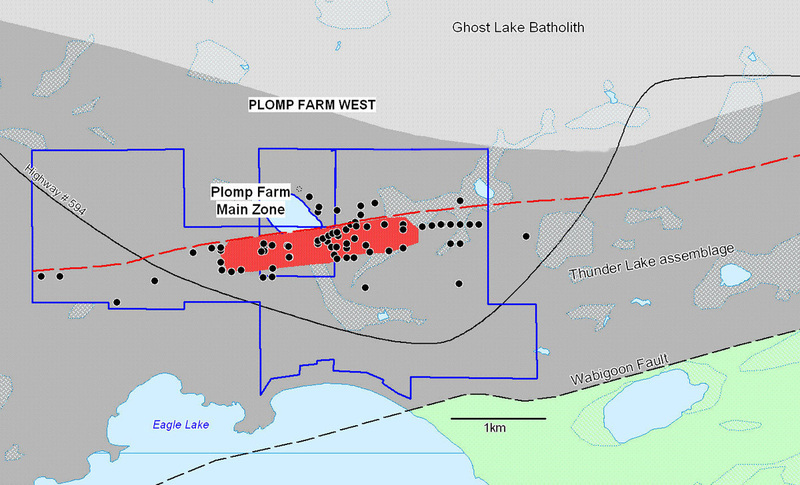 The Plomp Farm Property is located 20km west of Dryden in NW Ontario. 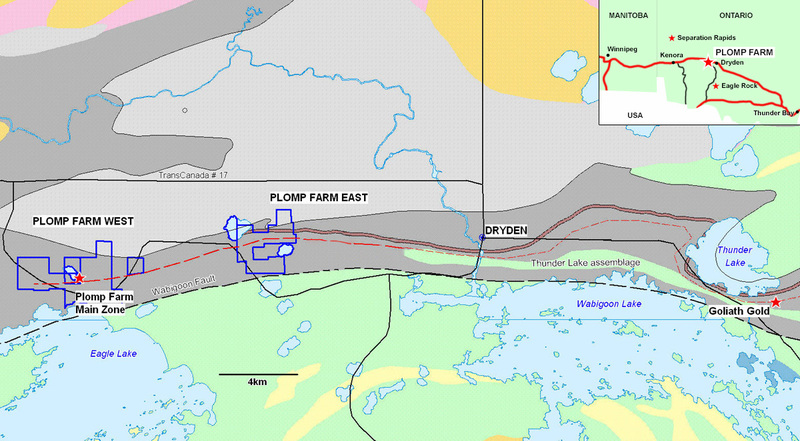 The property occurs in two main blocks that overlie 13 km of favourable stratigraphy within the Thunder Lake assemblage. 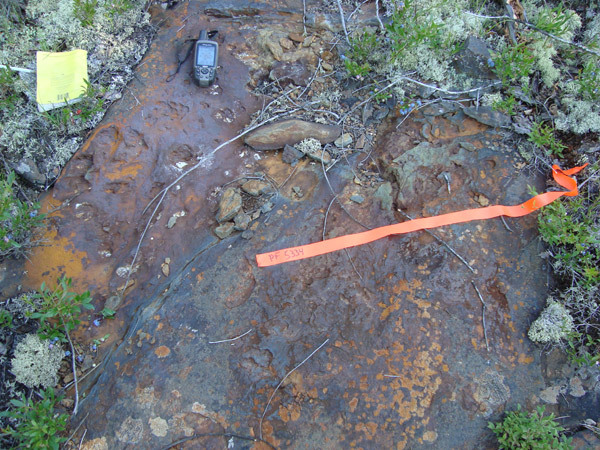 The West block hosts the Plomp Farm Main Zone where mineralization occurs within a broad corridor of gold enrichment associated with pyrite and elevated silver and base metals (Cu-Zn-Mo and Ba) concentrations. 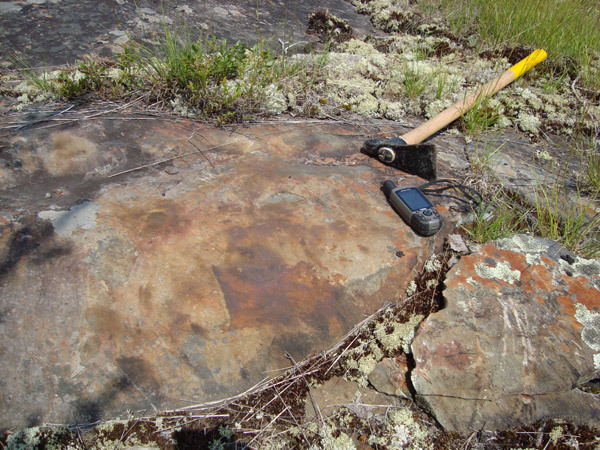 For example, diamond drilling has intersected a 36 metre wide zone of altered felsic flows with 1 to 3% pyrite, chalcopyrite, sphalerite, and gold mineralization. Within the corridor, higher grade zones appear to occur as ore shoots with gold grades locally >3 g/t and corresponding base metal values of <0.5% Zn + Cu. Individual intersections include 7.84 g/t Au, 27 g/t Ag, and 0.11% Zn over 2.0 metres, several others have yielded values of ranging from 3.4 to 34.9 g/t Au with > 0.27% Cu. Another hole encountered 5.2 g/t Au, 25 g/t Ag, and 7.99% Zn over 1.5 metres within an altered quartz-sercite schist (felsic volcanic). 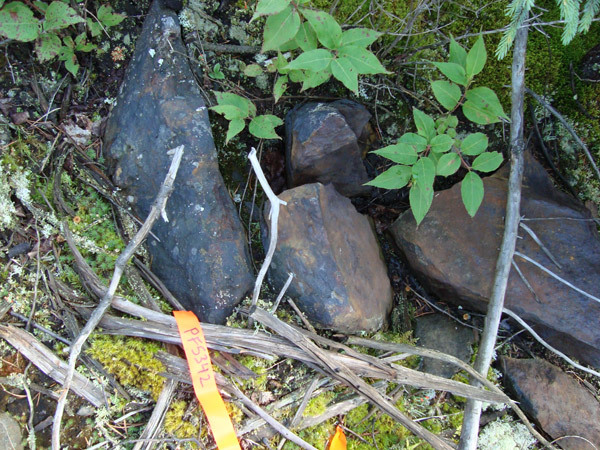 The Thunder Lake assemblage of altered, mineralized felsic volcanics and sedimentary rocks can be traced eastward from the Main Zone across the East block of claims. The East block overlies this favourable assemblage and remains under-explored for its gold potential. Main Zone drilling outlines a strong gold-bearing system over a 2 km strike -- results include 31.7 g/t Au, 33g/t Ag, and 1.36% Cu / 0.4m. Other results include 7.84 g/t Au over 2.0m. Drilling continues to define extent of the system, in particular the orientation of the higher-grade ore shoots. Compilation and re-interpretation of historical results. 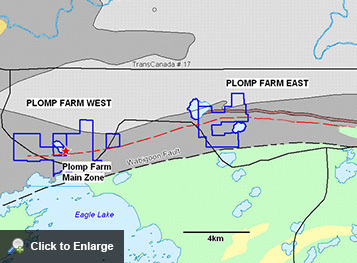 Champion Bear Ltd., Plomp Farm Resource Estimation and Technical Report published February 5, 2018.